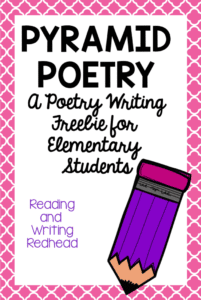 Poetry isn’t just for National Poetry Month! I love to teach it all year with my second grade students. I usually start out with acrostic poems, as most have had some experience with them. We also try simple rhyming couplets and cinquains also. I have also tried other types like Haiku and Limericks. I usually save pyramid poems for the second half of the year. Students need a good handle on nouns, verbs, adjectives and some experience with adverbs to do this kind of poem. Poetry is not just for poetry month! 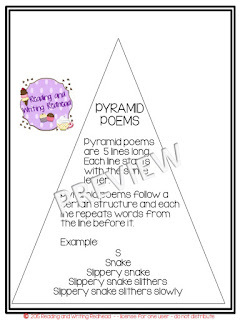 Students will love these pyramid poems! One of my tips before you teach start working on these is to make an anchor chart. You can make it yourself or work with your students on it. I usually list the letters of the alphabet A-Z down the side and we try to think of at least two or more adverbs for each letter. 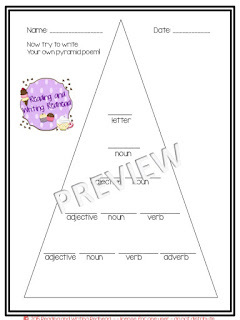 Teach pyramid poems this year with this freebie. With it, students will learn about pyramid poems, read a sample, and then try to write their own. It was created for grades 2-5. Above is the sneak peek and if you want to grab the free download, click here or on any image above! Enjoy! If you would like to take a moment and give feedback after you download it, I would appreciate it! Thank you!